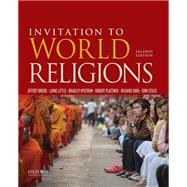 Featuring a unique, consistent, and modular chapter structure--"Teachings," "History," and "Ways of Life"--and numerous pedagogical features, Invitation to World Religions invites students to explore the world's great religions with respect and a sense of wonder. This chapter structure enables students to navigate each religion in a consistent and systematic way and helps students to make comparisons between religions. The book describes the essential features of each religion and shows how the religions have responded to basic human needs and to the cultural contexts in which they developed. The authors also encourage students to develop an appreciation for what religious beliefs and practices actually mean to their adherents. Jeffrey Brodd is Professor of Humanities and Religious Studies at California State University, Sacramento. Layne Little is Lecturer of Religious Studies at the University of California, Berkeley. Bradley Nystrom is Professor of Humanities and Religious Studies at California State University, Sacramento. Robert Platzner is Professor of Humanities and Religious Studies at California State University, Sacramento. Richard Shek is Professor of Humanities and Religious Studies at California State University, Sacramento. Erin Stiles is Associate Professor of Anthropology at the University of Nevada, Reno. The Buddha's Teachings on Ethics and "Skillful Means"
What Is "New" About New Religious Movements?